Take a dare and see where it goes! I forgot to take a photo of the string at the beginning but I think this one might give you a glimpse of what it was. I so needed a dare....thanks Erin! 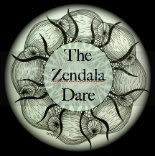 Zendala dare 19 is up and running. I am still thinking in mooka mode...yet there was some real fun working with squares. It may be a few days before I return.... a deadline on Tues.....but then, I bet I will look for stress relief and l find the time somewhere! Thank you Erin for this great challenge! Erin issued her new dare right on schedule! I have been watching the Olympics in the morning and so this is probably again inspired by a nautical theme. How those athletes push the boundries to new heights is always inspiring! It has been a fun couple of weeks watching my favorite sports and some new ones that I had never watched before. Happy tangling all you zentangle stars out there! What a great challenge!! I just love Shelly's style of tangling and it is a so fun to give Brayd a try! I am not sure I can get it to look like Shelly does but I will keep on trying until the week is over. Thank you Shelly and you Laura for the challenge! This one not very well put together but I really enjoyed playing with the brayding! Brayding while watching the olympic 10k women's swimming meet! Had a family reunion and today was the first day that I could work on the dare. I have tried several times and I finally just have decided to post. This one was a challenge.......can't wait to see what you have all done! I have been blessed not to lose any immediate family to cancer, however, I did lose a dear friend. I would like to dedicate my tiles to LeAnn and to her children who had to say good -bye to her in their tender years. How I miss her wonderful gift of love!